Few painters have expanded the original impulses of Abstract-Expressionism in more directions than John Walker. During the course of his half-century of painting, he has incorporated into his canvases written poetry verses, concise renderings of skulls and allusions to both aboriginal art and the old masters. 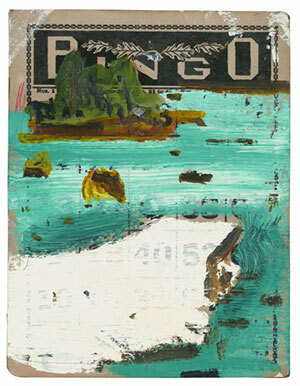 He has pushed painting’s material limits, employing shaped canvases and large-scale collage techniques, and mixing all manner of ingredients into his paint: gels, chalk dust, and more recently, mud. But his biggest departure from “classic Ab-Ex” may be his reliance on the perceived world. Although moodily abstracted, his images from the last decades have been consistently inspired by observations of the real. His urgent strokes and brooding color, moreover, reveal a certain discipline of form; their forces build in ways that create discrete, tangible presences in his paintings – a feat of internal composition that hints as much of European modernism as the New York School. If the artist is an Abstract-Expressionist, he’s an unusually worldly one. Most of the large canvases are divided into contrasting planes of parallel, sometimes zigzagging, lines. Often they include one or two realistic tokens of the actual scene: an island covered with trees, the small circle of a sun or moon. These paintings manage to convey nature’s immensity even as they mangle its topography. In “The Sea No. II” (2014), for instance, a large, white shield-like shape, articulated by vertical green stripes, hangs before horizontally striped deep blues. The energy of the forms is clear, even if their perspectival relationships aren’t; it represents a point of land intruding weightily upon the water’s spreading surface. At the top, a red sun tips into an unlikely indentation in the horizon. A sprouting of greens interrupts the blue halfway up the canvas. The lower half of the shield-form has the rough texture of mixed-in earth, grounding it metaphorically. But the metaphor isn’t really necessary; one senses land against shimmering expanse, the remoteness sun and sky, and the isolation of a tree-covered island. One absorbs the usual paradox of painting: material representations of the immaterial. But one experiences something else, as well – a representation made especially vital through abstract means.